​CUPE 1949 members are administrative assistants, legal assistants and lawyers that work in Legal Aid offices across Saskatchewan. Several years ago, during a membership meeting, we discussed getting involved in a movement to support union activity internationally. One member discussed the dangers and risk of grave harm that union leaders and members face in Colombia. As a local, there was a strong sense that we should be more active in promoting our shared values of social justice, both as union members and legal professionals. After discussion, our local passed a motion to provide financial support and to partner with Nomadesc, an organization working mainly in southwestern Colombia. Nomadesc is a human rights organization that advises and accompanies members of social organizations, unions and other organizations. It works to defend the rights of Colombian communities and trade unionists through education, accompaniment, advocacy and mobilization. Nomadesc is having an impact in Colombia. Through updates, we have learned of the organization’s continued efforts in engaging local community leaders in human rights education and building networks that repair the social fabric of their war-torn country. Nomadesc works directly with victims of the conflict to assist with access to the justice system. Given that our membership works to provide individuals with assistance and fair representation in the justice system, our partnership is well matched. 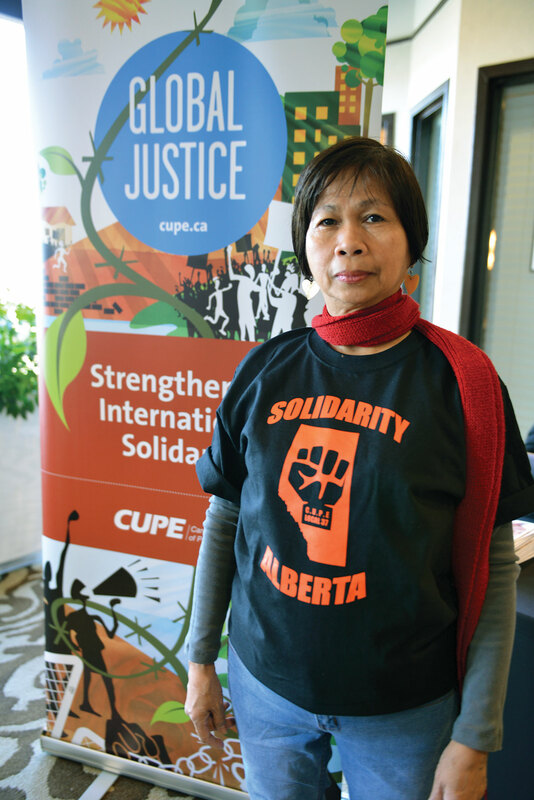 At the CUPE Saskatchewan convention in March, delegates heard from another courageous union activist - this time from the Philippines. Rose Nartates is an activist within COURAGE – Confederation for Unity, Recognition and Advancement of Government Employees. Hearing Rose speak about the struggles that union leaders, members and workers are facing in her country reinforced my belief that we need to be ever diligent in our commitment to work collectively for the advancement of workers, both in our own communities and in the global village.